Where do I start, part deux? We drove three days from Virginia to Florida and got settled into our camp in Wickham Park. This is a very nice county park which has upgraded to full hookup sites. We stayed here years ago but it was quite a ways from Brandon's house and then there were those itinerant gypsies who took over one loop of the campground. They have since moved on and since Brandon and Megan moved, they are less than two miles away from the park! Whoo hoo! The kids had just closed on their house on the Wednesday before our Sunday arrival and had not stayed at their new place till Thursday night. I was amazed when we got there, however, at how much they had accomplished. Brandon had actually emptied the two storage units he had as well as the pod sitting in the driveway. A lot of the stuff was in the garage and there were a lot of boxes in the house to be emptied, but furniture was set up and the first night we were there, Brandon got the entertainment center up and the TV working. By the time we left, almost all the boxes in the house were emptied and put away and the garage was emptied enough to put Megan's car inside. They worked every day and we helped out while we were there. I watched Brynlee and Terry had several projects that required his expertise. Brandon wanted new fans in the a couple of the rooms, so Terry helped with that. This time around, however, he supervised and Brandon did all the work! They have a lovely lanai in the back, with access from several rooms. It is all screened in and there is a pool. It's lovely and we sat out there in the evenings and enjoyed the bug free environment. The first night there, I went with Megan and Brynlee to "Boo at the Zoo." The zoo was decorated for Halloween and the employees were passing out candy to the kids. It was a fun time and I think Brynlee enjoyed it. When it got dark, however, you couldn't see any animals. Yesterday Megan took us out to where the manatees hang out in the winter, but there weren't any there. It's been pretty warm there, so imagine it would take cooler water for them to head for the canals. We went to a boardwalk and walked out on the steps to take pictures of the ocean. It was really beautiful and Brynlee was mesmerized by the sand. I think she liked it on her feet, but after we got back in the car, she wanted the sand off her feet. Hah. That's a toddler for you! We enjoyed our time in Wickham Park, although we weren't there much. The girls stayed in the motorhome while we were gone, but we were there most mornings, came back for lunch, then out again, then back for supper. So they really weren't alone that much, got lots of walks in, chased squirrels and "observed" the armadillos. I don't think I would want the girls to try tearing into one of those, but I'm sure they would give it a shot. They were certainly curious about them and mostly just stood very still and watched them. We saw hawks, blue jays, scrub jays, and ibis. And also in the park we see tortoises once in a while. We saw two large ones (could have been the same one) and one small. They are very timid and it you try to get close to take a picture, they will head for the brush. Luckily, I had my good camera when we saw one out and I was able to get a few shots of him. We really enjoyed our time with the kids. They let us come and spend time when we could and we tried to help out as much as we could as well. I especially liked taking care of Bryn. After the first night, when she saw me come in the door, she would toddle up to me with her arms up. That melt my heart! Hated to leave the kids, but we will be back in the spring. We are headed west, spending tonight in Lake City, Florida. We drove a couple long days after we left Tab and Deanna's, but we wanted to get to Williamsburg to see the kids. Even though we would love to play tourist here, we were here mainly to see the kids. We did visit the Jamestowne Settlement, which is pretty neat. It is a re-creation of the original settlement. It is located just adjacent to the actual location of the settlement. There were costumed interpreters in the buildings and the kids had a good time. There were three sailing ships, replicas of the ones the early settlers used to immigrate here. It's so hard to believe they sailed in those little ships! I'm sure many ships were lost at sea, but I read about people like Ben Franklin who made numerous trips back and forth across the ocean. He had more guts than I! When we left Williamsburg, we headed back to Charlottesville. We ended up staying about 10 days altogether. The kids had planned to go to Tom's folks on the weekend, but they acquired a new member of the family! They got a dog, a Poodle rescue. Her name is Pepper and she is really cute. The first couple days she was very lethargic because she had just had her spay surgery and they also did a gastroplexy. That is tacking the stomach to the abdomen to prevent it from flipping and causing bloat, which is common in larger dogs and fatal very quickly when it happens. So she was very quiet for about 3 days, then she started interacting with everyone. She seems to be really sweet. She is curious about everyone and everything and she is young enough to still have "puppy" in her. She is getting into things she shouldn't, so they will have some training to do, but they are already doing that. I think she will be a wonderful addition to the family and will enjoy their outdoorsy life of hiking in the mountains. Terry caught a bug in Williamsburg and got pretty sick with a cold that followed him to Charlottesville. It didn't help that the weather was colder and rainy most of the time we were there either. In fact, most days, he stayed behind at the motorhome while I went in to see the kids. Each of the kids got sick as well, but their's only lasted a day or so. I sat and held Aenea as she slept with it. She slept almost 36 hours straight, but when she woke up, she was fine. We really enjoyed our time there. 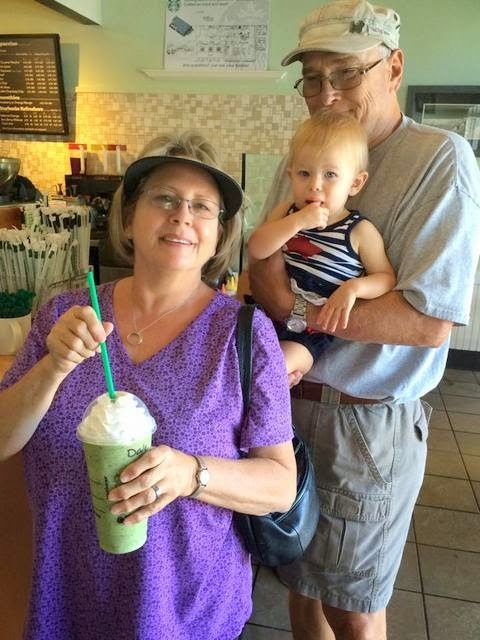 I got quite a bit of grandkid time in and have the pictures to prove it! They are both sweet and loved the attention. I learned how to play some video games of Ronan's. . . well truth be told, I didn't learn much, but did try to play. In fact, Terry even took a turn at that. It was an enjoyable time to visit with them all and I hated to leave. We did leave, though, because we are headed to Florida to see Brandon, Megan and Brynlee. They just closed on their new house and started moving into it on Wednesday. We are anxious to see it and to help take care of the baby so they can get stuff put away. We left Charlottesville on Friday, spent last night in Charlotte, tonight in Darien, Georgia, and should be in to Melbourne tomorrow. It has been a hectic summer for us. When we arrived in northern Indiana we had an apartment to re-hab and it took a while to do that. I had been bitten by the influenza bug and it was taking a toll on me. I couldn't work for long on any one day, so I worked what I could when I could. We had decided to sell the duplex and so we didn't want to rent it. That was so a new tenant didn't have to change landlords right after moving in. I don't think that would be fair. We had planned to spend a month in Wisconsin, but we had a buyer for the duplex (who said he actually wanted to buy multiple units) who strung us along for way too long. I finally got tired of it and went to the next buyer on the list, but it was too late for us to go to Wisconsin. We had multiple people interested in buying the duplexes, so the prospects were good we would sell. And we did. Two days after we sent the first buyer on his way, the next one made an offer. We are happy with them, because they own a duplex they bought from Terry's Dad and it is next door to the one we sold. In fact, the buyer has often done service work for us when we are gone in the winter and is familiar with all the buildings and knows how they were built, etc. Since the August sale, they have purchased the second duplex we had for sale. The deals are all sealed, signed, and delivered and we are very happy with that. We have left northern Indiana now and headed south. We are in central Indiana where we have seen the dogs' vet and went for bloodwork and haircuts today. Tomorrow Terry sees his new cardiologist in Indy and tomorrow night we will visit some friends in Muncie. The girls will get to play in Baxter's yard. Baxter is a Scottie as well. Thursday we see our family physician and then Friday we roll. We plan to stop by and visit with our Alaska travelmates, Tab and Deanna, in Ohio before heading to Virginia, Florida and finally Texas! Last Friday we loaded up MinnieMee and grabbed the dogs and headed for my sister Nita's woods south of Warsaw. We were part of an elaborate event and our part was what I called "support." We spent the weekend visiting with Mom and Dad and taking care of Nita's four dogs and three cats. Nita and Jim left Friday evening for Chicago, so they could catch a plane on Saturday morning for New York. Their daughter Kellie was already in New York, Long Island, to be exact. 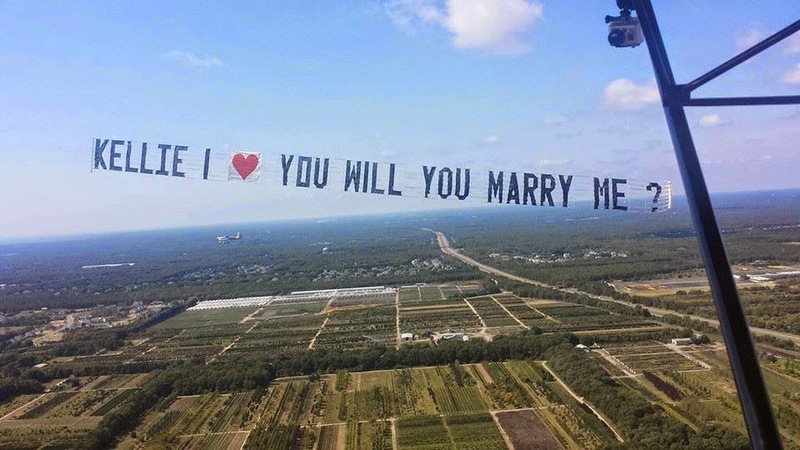 She was out there supposedly for an air show, but her boyfriend had planned an elaborate "engagement" for her. 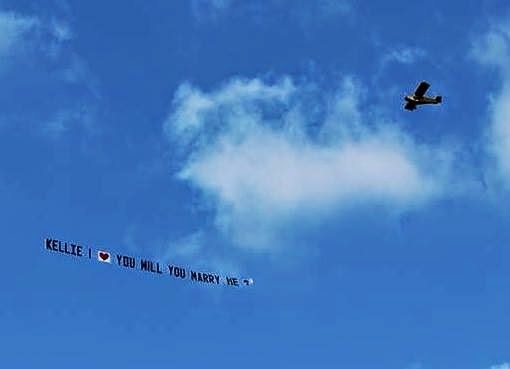 Since Tommy is a pilot, he took her up in a plane and had a friend of his fly another pulling a banner which read, "Kellie, I love you. Will you marry me?" She said "YES!" He pulled the whole thing off perfectly. 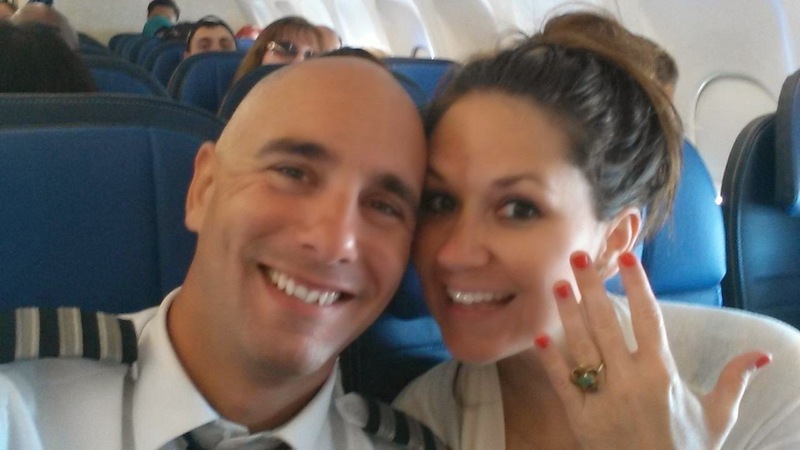 When they landed, she was shocked to see her Mom and Dad and many of Tommy's family and friends there to help celebrate their engagement. Such a happy time! In the picture, Kellie and Tommy are in the plane in the upper right corner. The right is a closer look at the banner. We just relaxed at the woods. On Saturday night, we had storms and since Nita has one dog afraid of storms, I spent the night at their house. The other nights they did fine by themselves, but I didn't want Phineas to be stressed, so I took him to the downstairs bedroom and he slept next to my bed on the floor. He is a sweet dog. Our television reception was not too good. . . we got plenty of stations, but if the wind was blowing, and it did all weekend, the trees were interfering with our signal. So we did watch some movies and played on our computers since we had wifi. On Saturday, Michelle and Staci and their families came down to see Mom and Dad. We visited with them and had a great visit. I had to leave to go tend to the dogs when the storm got bad, but it was great visiting with them. We are back in Elkhart at the campground and today we cleaned up MinnieMee and have her ready to put back in storage tomorrow. We are getting things around and finishing up some last minute stuff as we are leaving Sunday and headed south. We start with doctor appointments next week, then we are headed for Virginia.